Rachel and I had intended to start early in the Hen House but our start was delayed because of a contretemps about our insulation delivery. I had ordered a load of insulation from Insulation Direct. It was promised for yesterday but hadn’t arrived. I telephoned this morning and they ‘phoned back to say that the consignment had gone missing en route and that they couldn’t now deliver any insulation until next week. In the end they refunded my money and left me without insulation, all pretty shoddy. Next I went on to the website of Wickes who advertised next day delivery and free delivery for orders over £300. Not however, as I discovered, if you live near Berwick. Delivery here couldn’t be made until next week and there would be a delivery charge of £80 because we live in such an out of the way area! What bugged me was not the charge or the delivery arrangements but the fact that the web-site said something different (until you read the small print). I think it is terribly dishonest and I told the company so. However the upshot is not all bad, I am getting my delivery tomorrow and it won’t cost me £80, but I don’t think that I will buy from Wickes again. But that didn’t help with the insulation I needed for today. I hadn’t gone to Pearsons (who supply just about everything I use) because I knew that they didn’t keep slab insulation. But I went up and told them about my problem and they took me away to a far corner of the yard, opened a lorry cover and produced something which got us through today. Now they really are stars and we are fortunate to have them so close to hand. I came home and we got started – there then followed a stream of hugely pleasant interruptions: first Ann bringing Mum home from the book club they both attend in Duns (we had coffee together), then David who really is quite crippled with his bad knee but who managed to climb the stairs to the Hen House to advise on where to make holes in the plaster board for electrical installations in the future, and finally Tom and Dorothy on their way home from getting the car repaired well that's another story, too). Today is Dorothy’s birthday so we drank coffee and ate Panettone to celebrate. 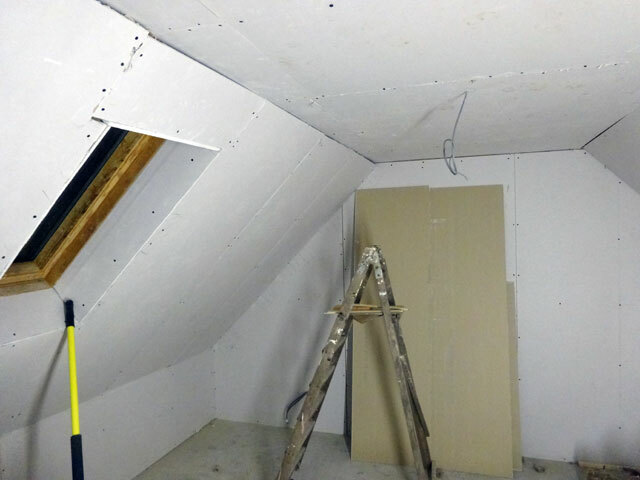 Rachel and I had set a target of completing one wall in the bedroom today and we almost made it, returning after supper in the farmhouse (and after I had driven Mum to the Guild in Duns) to complete the final roof panel.